Growing indoors can be very rewarding and the HQRP 135 watt LED UFO may be the best LED grow light to support your specific growing needs. LED grow light technology continues to improve and the benefits that LED grow lights can provide are numerous. LED grow lights can be more efficient and effective than traditional grow light alternatives like HIDs, which can help to not only save an indoor grower money in the long run, but also support a robust and bountiful plant yield. The HQRP is a high powered multi-band LED grow light that is relatively inexpensive and can be used to support the complete grow process of a plant, or small number of plants, grown indoors. 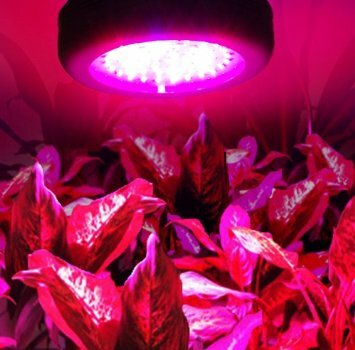 The HQRP emits light designed to replace the sun’s light by incorporating light color wavelengths that support and encourage the plants’ photosynthesis process. Throughout the rest of this comprehensive LED grow light review, I will provide the HQRP product specifications as well as expand on the unit’s abilities. My aim is for indoor growers to review this information and use it to make an informed decision when selecting the best LED grow light. There are a lot of options out there and I hope that this information helps you find the best LED grow light that will help you to grow big at home! The grow light technology integrated into the HQRP is scientifically proven to be effective. It is specifically designed to include 6 bands of color wavelengths that include red, blue, orange, white, UV and IR. These wavelengths are all research proven to support a plant’s growth process in different ways. The HQRP LED grow light also comes with a UV chain and a UV meter. The ratio of colors included in the HQRP also varies depending on the color. Red and blue wavelengths are very important for plant photosynthesis and so more of these colors are included in the HQRP 135 watt. The unit consists of 45 LEDs and has three built in cooling fans. The great thing about LED grow lights is that the integrated cooling fans are all that is needed for cooling. LED grow lights produce little heat and so unlike HIDs, no additional cooling systems are necessary. Start up cost of this grow light is also quite minimal. The light can be purchased for just over one hundred dollars which includes shipping and handling. Light wavelengths emitted range from blue and red, to white, infrared and ultraviolet. This is very important for plant growth given that the wavelength range between 400nm and 700nm is research proven to be the light wavelength range that is most effective at driving plant photosynthesis. This range is known as the photosynthetic active radiation zone or (PAR). 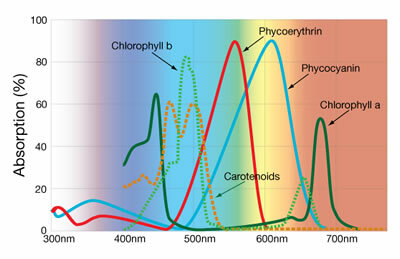 Red and Orange wavelengths (630nm – 660nm) – Light in this range of the spectrum can act as a catalyst for large absorption of nutrients by chlorophyll that most critically influence the process of photosynthesis. Red light is used to encourage blossom and fruit. It is necessary to induce a successful bloom stage which helps the indoor grower achieve a bountiful yield. Blue wavelengths (425 nm) This wavelength helps to support peak plant chlorophyll absorption during the growing process. Blue light promotes photosynthesis and encourages vegetative growth and dense plant growth during the vegetative grow stage. White light (12000K) This light is like the light emitted by the sun. White light from the sun is a mixture of all colors of the light spectrum from red through violet. It is supplemental for the plant so that maximum development potential is reached. Plants evolved and prosper under the light of the sun and so white light is a beneficial inclusion for the HQRP. White light is integrated because it mimics the type of light that plants would receive from the sun and thus encourages the process of photosynthesis in a comprehensive way. Infrared wavelengths (730nm) Infrared light is part of the natural light emitted by the sun. 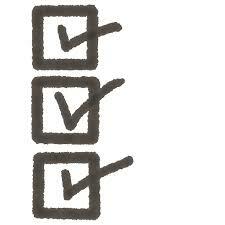 It should be used minimally, as it is in the HQRP. Infrared heat works to penetrate plant cells to promote health growth. IR will support plant bloom and help to produce lush flowering. Again, it is not needed in abundance, but can support well rounded plant development when integrated proportionally into a broader light recipe as it is in the HQRP. Ultraviolet wavelengths (380nm) Ultraviolet light is part of the natural light that is emitted by the sun and can be used minimally as part of a broader light recipe to encourage full and successful plant growth. Like infrared light, ultraviolet light is not used in abundance but a small amount of UV light can enhance plant color as well as plant aromas and taste. The absorption spectra of chlorophyll a and b extracts is why LED grow lamps are often engineered with blue and red LEDs like in the HQRP. During plant photosynthesis, chlorophyll a and b, as well as carotenoids, are the primary light harvesters in plants and they feed on the wavelengths in the blue and red region. This is why the HQRP grow light integrates this light type. The 6 Band Technology integrated into the HQRP emits these desirable wavelengths that key on absorption points along the photosynthetic spectrum to excite the photosynthesis process. The HQRP LED grow light includes a “light recipe” that research has shown supports successful plant growth. Emits light that research shows support plant development through the vegetative and bloom grow stages. 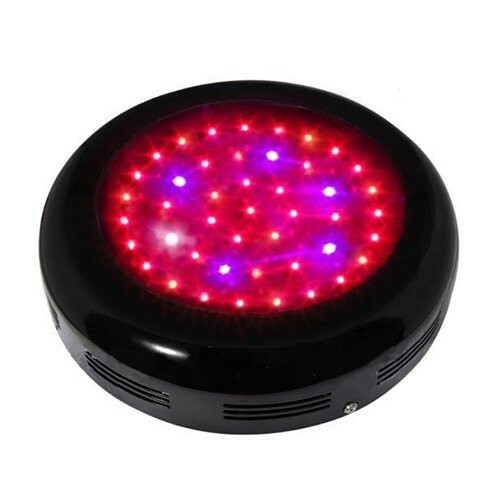 Red and blue light LEDs are proportionally high, yet UV, IR, and white light LEDs are also included. The LEDs integrated into the HQRP are rated to have a lifespan of at least 50,000 hours. This aspect of LED technology is of great benefit as it will save an indoor grower money over other traditional HID grow lights. LED grow lights like the HQRP are energy efficient and since they consume less energy than other traditional grow lights, they can save an indoor grower money over the long term. The HQRP LED grow light, like all LED lights, produce less heat than other traditional grow light alternatives. Producing less heat allows the indoor grower to save money on more expensive ventilation systems or air conditioning units. LED grow lights present almost no heat signature which makes their utilization one that can be discreet. LED grow light technology is efficiently built which makes the grow light more versatile. The grow light can be more easily set-up in little time. It took me less than 30 minutes to unpack, hang and turn on. LED grow lights need less space than HIDs since they produce less heat and the extra cooling equipment is not necessary. The HQRP is listed at 135 watts of power which is on the lower end of power given the vast array of LED grow lights out there. That being said, the HQRP does include the wavelengths that can optimize plant growth which allows the light to work efficiently. 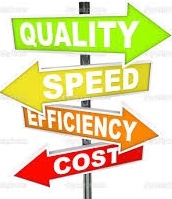 Since LED grow lights waste less power by only emitting research proven wavelengths, more can be done with less. Keep in mind that the highest PAR values are near the center of the light footprint. Placing plants outside of the HQRP’s light footprint range will greatly reduce the lights effective grow power. I hope that this comprehensive LED grow light review for the HQRP 135 watt LED grow light contained information that will help you to compare and contrast LED grow lights successfully. 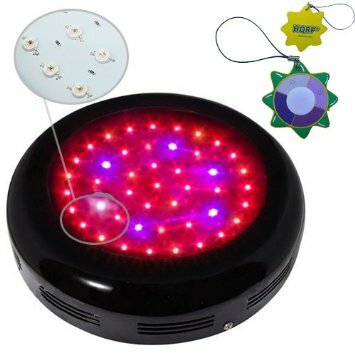 My aim is to support you in the process of finding the best LED grow light for your specific growing situation. The HQRP is designed for small indoor grow scenarios and the multi-band wavelength integration of blue, red, orange, white, UV and IR will support indoor grow success. The HQRP is relatively inexpensive for an LED grow light, yet still offers a blended light recipe to optimize plant photosynthesis and growth. 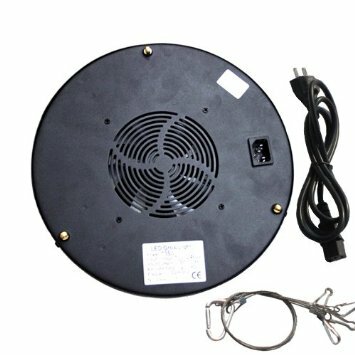 This light a good option for the indoor grower looking to provide light to a small number of plants. My hope is that this LED grow light review will help you to find the best LED grow light and success during your indoor grow. Good luck and grow big at home!